Serving a record 22 million passengers in 2017, San Diego International Airport (SAN) offers nonstop services to 70 destinations in the continental U.S., Europe, Asia, Mexico and Canada. In operation since 1928, the airport is celebrating 90 years of service to the San Diego region. The airport has been managed by the San Diego County Regional Airport Authority since 2003. On July 9, 2018, the San Diego County Regional Airport Authority released the Draft Environmental Impact Report (DEIR) for its Airport Development Plan (ADP), the centerpiece of which is the replacement of the 51-year-old Terminal 1. With construction anticipated to begin in early 2020 if approved, the project elements also include a new on-airport entry roadway, dual-level roadway and curbfront at the new Terminal 1, expanded close-in parking, and major airfield efficiency improvements. The ADP is a master plan designed to optimize the 661-acre site to accommodate the region’s demand for air travel and maintain high levels of passenger satisfaction. 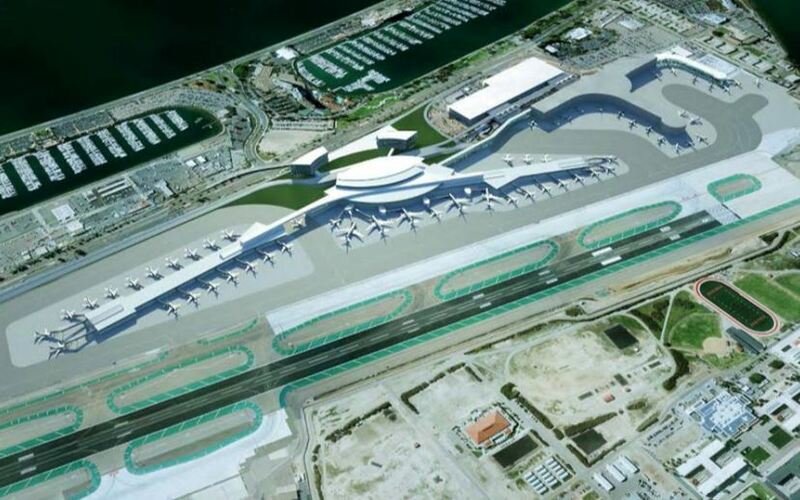 Current plans call for the Terminal 1 replacement (Phase 1a) to open in 2023. The cost for the entire project is estimated not to exceed $3 billion. As a self-sustaining enterprise that does not levy taxes, the Airport Authority will fund the project primarily through ongoing user fees. Phasing of the project elements will allow the Airport Authority to meet demands that might change over time, as well as facilitate financing. The DEIR considers potential impacts in areas including air quality, greenhouse gas emissions and climate change, water quality, traffic, and noise, as well as potential mitigation measures. As with past projects at SAN, the ADP will be implemented with six major sustainable design features. The project will target LEED Silver Certification or better, includes on-airport entry and loop roadways to reduce traffic on Harbor Drive, creates airfield efficiencies to reduce airplane taxiing and emissions, expands electric vehicle charging (airside and landside), introduces hydrant aircraft fueling (replacing airfield tanker trucks), and includes a massive (9 million-plus gallon) stormwater capture and reuse system. The July 9 announcement marked the start of a 45-day public review and comment period slated to close August 23. Public involvement is encouraged. The DEIR is online at www.san.org/plan and comments may be submitted to planning@san.org. Rendering courtesy of San Diego County Regional Airport Authority. See San Diego County Regional Airport Authority website.